Curated LoVid into the River To River Festival in 2010 (“Trichrome Navigation” and 2013 (“U R QR“). 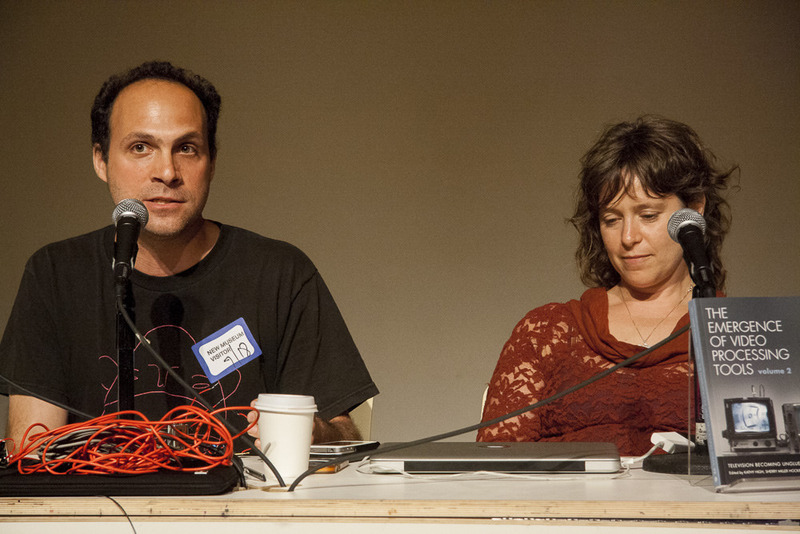 LoVid (Tali Hinkis and Kyle Lapidus) makes interdisciplinary works that explore the often invisible or intangible aspects of contemporary society, such as communication systems and biological signals, with a particular interest in the ways technology seeps into the evolution of human culture. Their practice includes performances, participatory public art, handmade technologies, textiles, prints, App-art, experimental video, and immersive installations. They focus on the juxtaposition of media with physical objects, geographic spaces, and the human touch and are interested in bridging between handmade engineering and traditional art or craft forms by using a DIY philosophy and aesthetic. They also apply machine-based and digital fabrication techniques to highlightthe critical importance of human/machine interaction in the digital age, invoking processes and ideas from art, science, and technology, to question perceptions of time, place, and the self in the networked era. LoVid’s collaboration began with audiovisual performances and has expanded to include a wide range of media, from prints to App-Art. LoVid’s performances were presented at Museum of the Moving Image (NY), Graham Foundation (Chicago), Eyebeam (NY), MoMA (NY), FACT (UK), PS1 (NY) and The Kitchen (NY), among many others. LoVid’s videos have been screened in galleries, festivals, and events worldwide including Modern Art Oxford (UK), Art in General (NY), Siskel Theater (Chicago), International Film Festival Rotterdam (Netherlands), and NY Underground Film Festival (NY). LoVid’s installations and objects have been included in solo and group exhibitions worldwide including The Neuberger Museum (NY), Netherlands Media Art Institute (Netherlands), Science Museum Jerusalem (Israel), CAM Raleigh (NC), Real Art Ways (CT), The Jewish Museum (NY), Science Gallery (Ireland), and New Museum (NY). In addition, LoVid creates large scale interdisciplinary projects that combine new technology with social interventions and public spaces. These have been supported by and produced in collaboration with Rhizome, Franklin Furnace, Elastic City, free103point9, The Robert Rauschenberg Foundation, Experimental TV Center, and LMCC. LoVid has received additional awards from NYSCA, NYFA, Foundation for Contemporary Art, and Greenwall Foundation. LoVid has participated in residencies with STEIM (Netherlands), Harvestworks, Eyebeam, Smack Mellon, and Cue Art Foundation.